In part (1) and part (2) I discussed the concept and some implementation details for BundleVersionChecker a set of editor classes to provide access to Unity’s PlayerSettings.bundleVersion (and bundleIdentifier) at runtime and an enhanced way of managing the history of versions to provide migration steps as necessary – at least since you have installed it. Now I show you how to use it in your project. 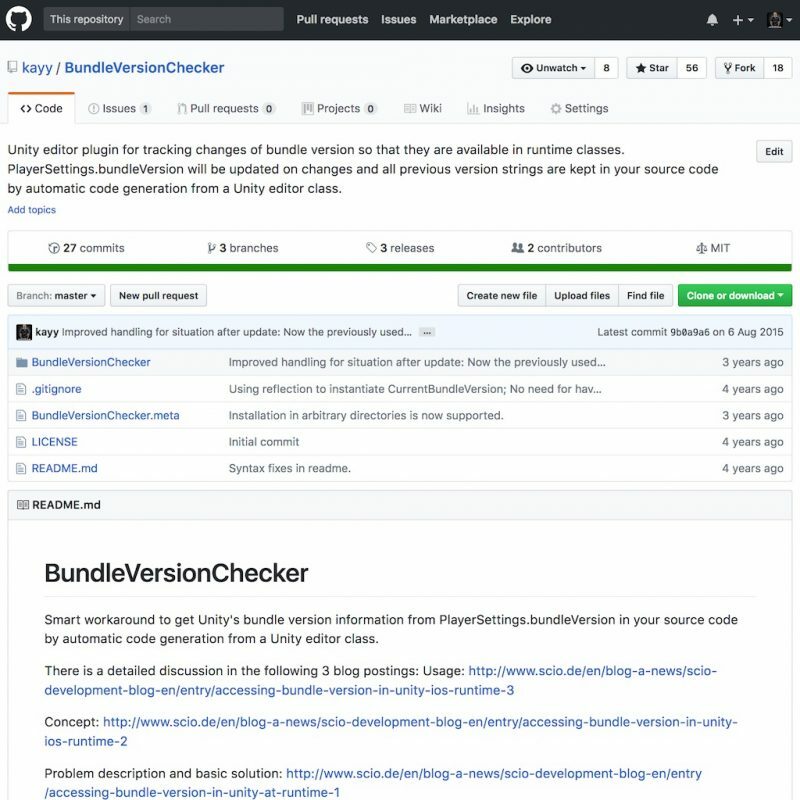 BundleVersionChecker is hosted at GitHub under MIT license so it’s free to use even in a commercial environment. Now you find 2 new classes in a new directory under Assets/Scripts/Config/Generated TrackedBundleVersion.cs and TrackedBundleVersionInfo.cs. As you see TrackedBundleVersionInfo objects can be compared directly with strings because all comparison operators are overloaded not only for TrackedBundleVersionInfo objects among themselves but for comparing strings with TrackedBundleVersionInfo as well. First off, I’d like to mention that changing the bundle identifier in player settings does not force Unity to refresh its assets database. So always a change of a script or other asset is needed to force BundleVersionChecker to get active. to fit your needs. There you can change the names of the generated classes too (OK, I never tested it …). If you need any changes to TrackedBundleVersionInfo.cs, you can do them in the generated class but should copy them to the template TrackedBundleVersionInfo.txt. This is used just once at the very first start, afterwards there is no need to recreate the class. This section will grow when users provide feedback. So don’t hesitate to use the comment section below, it works without registration until spammers will detect it. Q: I just changed the iOS bundle version in player settings. Why do I still see the old string in current? Q: What is this trackedMode flag in ConfigBundleVersionChecker? Q: Can I use it in commercial projects? Q: Where do I get more technical details? Q: Can I extend the functionality? Get your git clone and start 🙂 Thanks for sending a pull request. Refactoring to use UnityEngine.Application.version. Note that BundleVersionChecker still can be useful as it is more than jsut reading the curren versionbut also allows history tracking. Tests in Unity 2017 as I still run Unity 5. At the moment configuration data is read from class ConfigBundleVersionChecker. But it contains local information individual for every user as well. So if several people have BundeVersionChecker configured as a git submodule and have code improvement to be sent as pull request, these config changes will be included. A nice GUI showing the history. Maybe the possibility to add or delete old version keys. This happens when the installation directory is outside /Assets/Editor. When I started develping this for private use this was for fine for me. Now with a couple of users out there it’s pretty bad practice. I fixed this in the most recent release 0.8.6 so that you can install BundelVersionChecker at arbitrary locations under the Assets folder. Code generation stopped, no code to write. I am working with 4.6.2 and works as designed. Note that you have to put Unity into the background after a change so that it detects changes in the Assets folder. Are there any errors or warnings in the console view? StreamWriter fails miserably if file is readonly as some version control system works, like Perforce.